Orbits of various bodies in our solar system. 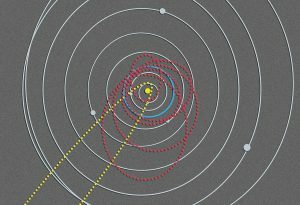 The Earth’s orbit is in blue, some examples of orbits of near-Earth objects are shown in red, and a long period comet is in yellow. Placing a space telescope closer to the Sun, for example in an orbit similar to that of Venus, allows for a larger viewing angle to see near-Earth objects. 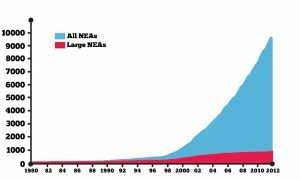 The vertical axis gives increasing size of threatening object. The horizontal axis gives the number of years prior to expected Earth impact at which the object must be intercepted. Each line on the graph represents a different method of deflection. As you can see, the sooner the asteroid is to hit the Earth and the greater its size, the fewer options we have for deflection. Source: Reproduced from: "Dealing With The Threat to Earth from Asteroids and Comets", IAA, 2009, p. 66. Tunguska blast area (1908) mapped out at the actual location and compared to major U.S. cities. An artist’s mapping of the Solar System on a logarithmic scale. The planets are various sized dots on the line, the edge of the Sun’s magnetic field is indicated as the heliopause, and the hypothesized location of the Oort cloud is shown at its farther distance. Compare two large space telescopes, Hubble and the James Webb Space telescope, with those proposed. Energy densities for wood, coal, and petroleum, do not include the mass of oxygen required for combustion, since in their typical applications, it is simply drawn from the atmosphere. Values for hydrogen combustion are given with and without considering the mass of oxygen. The mass-ratio values given here correspond to a particular trip made on an inertial (rather than continually accelerating) path. Changing the distance of destination and the desired acceleration rate would alter the values. For example, a three-day trip to Mars, undertaken with a constant acceleration and deceleration of 1-g, would give mass ratios of 1.007 for fusion, and an astronomical 1026 for chemical propulsion. Even 20,000K fission would have a mass-ratio of 50 for such an ambitious trip. Since constant acceleration also requires accelerating, at each moment, all the fuel for the remainder of the trip, the fuel requirements increase exponentially with trip distance. Source: “Nuclear Explosive Propelled Interceptor for Deflecting Comets and Asteroids on a Collision Course with Earth,” J. C. Solem, Proceedings of the Near-Earth Object Interception Workshop, Los Alamos National Laboratory, New Mexico. 1992, January 14-16, page 121-130. 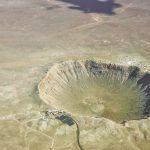 For example, take two notable cases: 1) the impact of an extremely large object, ~10 km, creating the 180 km diameter Chicxulub crater in the Yucatán Peninsula in Mexico, formed around 65 million years ago, which may have helped put an end to the dinosaurs; and 2) the Tunguska event in Siberia, Russia, in 1908, which, though believed to have been caused by a much smaller object, only about 30-50 meters across, resulted in local devastation. These two significant cases will help provide a sense of a range of possible scenarios. Based on studies of Mexico’s Chicxulub crater, it has been estimated that a roughly 10 km object, hurtling at around 20 km/s (~45,000 mph), slammed into the Earth ~65 million years ago. Though the exact details of the effects are left to models and simulations, we can certainly get an idea of the scale of destruction: mega-tsunamis ((Megatsunami is a term used to describe a tsunami that has wave heights which are much larger than normal tsunamis. They originate from a large scale landslide or collision event, rather than from tectonic activity. A recent example is the 1958 Lituya Bay megatsunami, near Alaska, which resulted in a wave hundreds of meters high, the largest known in modern times.)) thousands of meters high; an expanding cloud of boiling dust, vapor, and ash; rock and other surface material ejected out of the atmosphere, raining back down over a huge area, redhot from its atmospheric re-entry; and shock waves that trigger volcanic eruptions and earthquakes around the entire globe. To give a rough sense of scale, the energy released by such an impact is estimated to be in the range of 100 million megatons of TNT, 20,000 times larger than public estimations of the entire global thermonuclear weapons stockpile (see table I). In addition, besides the immediate effects of collision, an impact this large would launch so much dust and debris into the atmosphere that a dust cloud would cover the entire planet, blocking out the Sun for years: the impact winter, only one of many possible long-term, global effects. Fortunately, the Chicxulub case represents an extreme, and relatively rare threat. 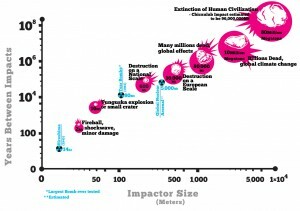 Such large impacts, though more destructive, are much less frequent than smaller impacts. As will be expanded shortly, our neighborhood in the Solar System is populated with many asteroids and comets; however, the frequency of impact by these objects, generally, is inversely proportional to their size. Nevertheless, while a big object, in the range of 1 km or larger, can create massive global damage, even a relatively small object, can cause significant damage. In order to put the range of threats further into perspective, this table presents a comparison of the levels of energy released from various types of events, both manmade and natural. It is also highly important that we determine the physical composition of the interplanetary bodies. Some of the deeper implications of this will be discussed in the sections on defense options and exploratory missions, but here we must note that not all of these objects are structurally similar. Some are almost solid iron-nickel, some solid rock, while many others are loose piles of smaller objects held together by their gravity (sometimes referred to as flying rubble piles). The next question is, where do these objects come from? Our solar neighborhood is much more populated than you may realize. Here, we concentrate only on two specific classes of objects: near-Earth objects and long-period comets. The classical image of our Solar System, four inner planets, then the asteroid belt, followed by four outer planets, while true, does not present the full picture. As Johannes Kepler indicated, and as Karl Gauss proved, there is a major discontinuity between Mars and Jupiter separating the inner from outer planets, which is the home of the majority of the asteroids in our Solar System. However, in addition to this “main belt” of asteroids, there are other populations of asteroids and comets. Some share Jupiter’s orbit. Some dwell in between Saturn and Uranus. Many populate the area of the inner planets, including around Earth. The most successful way to further investigations of the ordering of the entire Solar System will be an elaboration of the methodological approach of Kepler and Gauss, the great minds who discovered the ordering of the Solar System. Instead of starting from pairwise interactions, we must investigate the Solar System as a single, harmonic system, taking a top-down view of the orbital systems and subsystems. Ultimately, applying those methodological considerations will be the key to improving our understanding of the orbits, and determining well into the future what bodies may threaten our planet. The defining character of NEOs is that they orbit the Sun in paths that are either in the same general region as the Earth’s orbit, or can even cross the Earth’s orbit on a regular basis, raising the possibility of a collision with the Earth at some point in the future. Though not all NEOs pose a threat to the Earth, a large number could. Of these, a number have orbits which come within 0.05 AU of the Earth’s orbit, and are large enough to cause damage to the Earth. These are referred to as potentially hazardous objects (PHOs). ((AU stands for astronomical unit, the average distance from the Earth to the Sun. It is used as a standard measure of distance in the Solar System. Also don’t be fooled by the image above, as bodies in the Solar System orbit within a thin volume, not a flat plane. Two orbits that may look like they intersect, when drawn on paper, may not, because one could be above the other.)) This particular class of objects are of great concern for government agencies and scientific organizations all over the world, who have set out to find and track them, in order to identify potential threats, and to give advanced warning time to prepare defensive actions if needed. Before going into the current estimations of the NEO population, how to observe and track them, as well as defense options, we must first identify a second class of potentially threatening objects, long period comets (LPCs). The orbits of these comets are completely different from those of NEOs. Whereas NEOs spend their entire life in the inner Solar System, long period comets spend the vast majority of their lifetime out in the farthest depths of the Solar System (often well beyond the orbit of Pluto.) The extreme ellipticity of some of these distant creatures can take them on rapid trips through the interior of the Solar System, and possibly across Earth’s orbit. 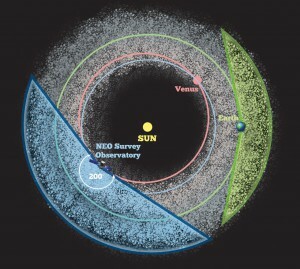 Currently, compared to NEOs, we see far fewer long period comets passing our region of the Solar System, so it is expected that their impacts with the Earth are much less frequent. However, they have hit the Earth in the past, and if one were on a future impact trajectory, its great speed, large mass, and undetectability until close to the Earth would make it a particularly dangerous global threat. These are the type of bodies that could eliminate all human civilization with one impact. There is also reason to believe that the population of long period comets which pass into the interior of the Solar System is not completely random. The current hypothesis is that these long period comets may originate from an extremely distant spherical structure surrounding the Sun, at the farthest reaches of the Solar System, known as the Oort cloud. Presently we do not have the observational capability to see comets that far away (a 10 km object at 10,000 times the distance of the Earth from the Sun is hard to spot), but it is thought that the number of large comets (larger than 1 km) in the Oort cloud is in the range of trillions. Since they extend so far beyond the Solar System, these comets become sensitive to galactic factors. 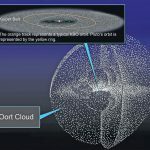 Other stars coming close to our Solar System can perturb the Oort cloud, changing the orbits of potentially millions of comets. Beside individual influences, at these distances, the gravitational effect of the Sun is less dominant and the general gravitational field of the galaxy begins to have an influence—an effect which varies as the galaxy evolves, and as our Solar System travels through it. Even though our current scope of understanding regards these galactic processes as having slow, long-term effects, they are the type of considerations that mankind must begin to take into account at this stage. First and foremost, there is still little in the way of solid knowledge about these outer regions of the Solar System, and much less known about our Solar System’s relationship with our galaxy and how those galactic changes affect us here on Earth. 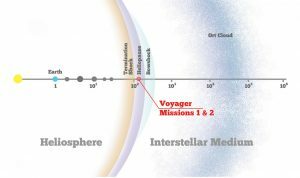 There are many theories and models, but as we are reminded by the fact that recent readings from the two 35-year old Voyager spacecraft continue to surprise the scientific community, we cannot assume that we understand these neighboring regions, or the solar-galactic interactions, until we go out and investigate. If there is some doubt as to why mankind has an imperative to understand our solar and galactic environment, let long period comets draw for us a larger neighborhood. While our current capability to defend against the threat of long-period comets is limited, the state of our knowledge of near-Earth objects is less uncertain. Due to their close orbits, near-Earth objects can be observed and tracked with Earth-based and space-based telescopes. Following on a few decades of observation programs, astronomers have developed a significant catalogue of known near-Earth objects. Depending on how well and for how long each individual NEO is observed, computer models can be used to extrapolate each NEO’s orbit and trajectory, years or decades into the future. ((Obviously, the more observations of an object we have, and the better those observations are, the better the forecast will be. Still there are certain subtle effects which require greater investigation, such as composition, spin rates, and non-gravitational effects, such as an uneven heating/emission action referred to as the Yarkovsky effect. Moreover, there are questions about the methodology of the computer models themselves: they generally rely on only a few dozen large bodies to model the field through which the others pass.)) These multi-decade extrapolations are crucial, since the key to defense against a potentially threatening asteroid is having as much advanced warning time as possible. Presently, we are far from having discovered and tracked every NEO, and that must be done. The limited population that has been characterized by current surveys has been used to extrapolate statistical estimations of the expected total NEO populations. For example, in September 2011, a NASA-led team published updated estimations of NEO populations based on the data obtained from the Wide-field Infrared Survey Explorer (WISE) space telescope. As is clear in table 2, we have been rather successful in identifying most of the larger NEOs. Of the discovered populations, some fit the specific category of potentially hazardous objects, meaning that their orbits come close to or even directly cross the Earth’s orbit. Currently, 152 of the discovered 850 near-Earth asteroids larger than 1 km are classified as PHOs, although none are expected to collide with Earth over the coming century. This is important, since 1 km is a rough division line between objects which would create truly global effects if they struck the Earth, and objects whose impact would produce a local or regional effect. Still, this leaves the vast majority of medium and small-sized objects undiscovered: ~80% (over 21,000) of the middle-sized NEOs, ranging from 100 to 1000 meters; and ~99.5% of smaller NEOs, 30-100 meters (recall that the Tunguska-sized event is associated with objects in the range of 30-50 meters). Any of these undiscovered objects could already be on a short-term collision course with Earth, unbeknownst to us. Some are guaranteed to be, at some point in the future. We are still essentially flying blind through our populated region of the inner Solar System. Further analysis has provided estimations of the frequency with which various sized NEOs and comets impact the Earth. ((For example see, Catastrophic Events Caused by Cosmic Objects; 2008, Springer; Chapter 2, “Size-frequency distribution of asteroids and impact craters: estimates of impact rate.”)) As implied by the NEO population estimates referenced above, and as indicated in the graph on the preceding page, there is a direct relationship between the size of the NEO, the population level, and the impact rate. These estimations of NEO populations and impact frequencies are still approximations, and should only be taken as temporary reference points, paving the way for more rigorous investigations. We cannot entrust human lives, or potentially human civilization, to betting on statistics which purely extrapolate from past events. They can be utilized in limited applications where useful, but only on the path to obtaining a principled—causal—understanding of the system. This requires both a dramatic expansion of our observational systems and our space-faring capability generally, as well as renewed methodological approaches to understanding the organization of the Solar System, and its relationship with the galaxy. Reliance on statistical extrapolations from the past leaves mankind completely blind to unexpected shifts away from present trends, driven by the development and evolution of the Solar System and galaxy—a process driven by future changes. Fortunately, mankind has not been completely negligent on the issue of tracking potentially threatening near-Earth objects (NEOs) and comets. In the United States, serious recognition of the threat of potential impacts with the Earth started to grow in the 1980s, and by the 1990s the U.S. Congress issued a mandate to NASA, tasking them to find and track 90% of all NEOs larger than 1 kilometer, in order to determine if any pose a threat to the Earth in the future. This mandate led to the development of the “Spaceguard” program, which is a loose alliance of survey programs which receive money from NASA to find and track NEOs. 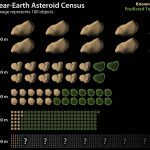 The past decades of observation under these programs have provided a start to addressing this planetary challenge, but, as is seen from the asteroid population estimates discussed above, we are still far from identifying all the potentially threatening NEOs which populate our immediate neighborhood. Looking to greater challenges, these existing NEO survey programs are not designed to deal with the challenge posed by the second class of rarer, but potentially more threatening objects, long-period comets, which come from the farthest depths of the Solar System, and are, for all practical purposes, impossible to detect at their great distances. To successfully tackle both of these threats, mankind must rapidly expand its sensory systems based on existing designs, while at the same time developing new technologies to handle threats outside of our current technological capability. The best possible option is for the United States, Russia, and China to cooperate in a joint science driver program, the beginnings of which have already been put forward by the Russian government in the form of the Strategic Defense of Earth proposal to the United States. A series of ground-based observation programs have been developed to search for near-Earth objects. The following chart indicates how many near-Earth asteroids have been discovered each year and by which observation programs. Observations from these and other telescopes are then centralized in the computer systems of the International Astronomical Union’s Minor Planet Center (Smithsonian Astrophysical Observatory, Massachusetts). These systems, along with NASA’s Jet Propulsion Laboratory (the Horizons Ephemeris Computation Facility) and the Near Earth Object Dynamics Site (NEODyS) at the University of Pisa, Italy, can then approximate the orbits of NEOs, and extrapolate their trajectories decades into the future. These surveys and orbital extrapolations provide the first line of defense. Detecting a threat decades before it may impact would provide the necessary time to launch a mission to change the threatening object’s trajectory. For these reasons, early warning is of the utmost importance. However, current computer simulations can not provide absolutely precise determinations of asteroid or comet orbits that far into the future, and instead provide a range of possible trajectories based on various uncertainties. While it is true that more observations lead to more accurate orbits, there are still limiting factors which keep scientists from achieving the accuracy needed. One crucial aspect of this problem is taken up in the interview with Claudio Maccone, on page 46 of this magazine. In addition to ground-based observatories, the first steps have been made to utilize space-based telescopes to improve our view of the Solar System. This option was demonstrated with NASA’s Wide-field Infrared Survey Explorer (WISE), an infrared space telescope which only operated for a short period of time, but opened a completely new window to view our neighboring asteroids and comets. Seeing these objects in the infrared end of the spectrum (which can only be done from space) provides an improved capability to determine their size, and to see small dark objects. These first steps have been useful, but even with a decent discovery rate by present systems, it will take us decades to begin to come close to identifying the total population of near-Earth objects alone. It is time for nations to take up this challenge in a serious way. Up to the present, these efforts have been limited to a small number of concerned scientists who have demonstrated the existential importance of asteroid and comet defense. Their initial accomplishments could be rapidly expanded by an international mission. This chart illustrates how infrared is used to more accurately determine an asteroid’s size. 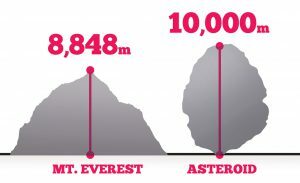 As the top of the chart shows, three asteroids of different sizes can look similar when viewed in visible light. This is because when visible light from the Sun reflects off the surface of the rocks, the more reflective, or shiny, the object is (a feature called albedo), the more light it will reflect. Darker objects reflect little sunlight, so to a telescope from millions of miles away, a large dark asteroid can appear the same as a small, light one. In other words, the brightness of an asteroid viewed in visible light is the result of both its albedo and size. The bottom half of the chart illustrates what an infrared telescope would see when viewing the same three asteroids. Because infrared detectors sense the heat of an object, which is more directly related to its size, the larger rock appears brighter. In this case, the brightness of the object is not strongly affected by its albedo, or how bright or dark its surface is. 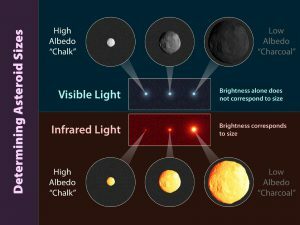 When visible and infrared measurements are combined, the albedos of asteroids can be more accurately calculated. Included in the recommendations is the construction of one or more space-based infrared telescopes dedicated to accelerating the detection and characterization of the NEO population. As discussed above, utilizing the infrared region of the spectrum provides an improved ability to see and identify these bodies. It was recommended that one or more of these infrared space telescopes be placed in orbit around the Sun, but at a distance similar to that of Venus. Because we can only see these objects when looking away from the Sun, this position, being inside the Earth’s orbit, provides a better viewing angle to see a larger section of the NEO population. While long-period comets do have a lower frequency of impact, this does not mean that we should ignore the problem. There have been preliminary investigations into what would be required for adequate detection times for long-period comets, most of which focus on developing space telescopes with much larger apertures to be able to see deeper into space. For example, one analysis discussed using light-weight structures to construct 25, 50, or even 75 meter telescope diameters. ((“Obtaining long warning times on long-period comets and small asteroids – Extremely large yet extremely lightweight space telescope systems,” Ivan Bekey, 2004 Planetary Defense Conference: Protecting Earth from Asteroids; Orange County, CA; Feb. 23-26, 2004.)) This would be a dramatic improvement, ((The Hubble space telescope is 2.4 meters across, and the James Webb space telescope will have a diameter of 6.5 meters.)) and is thought to allow us to look deep enough into space to provide warning times for long-period comets on the order of 6, 11, and 16 years respectively. Given the sizes and speed of many of these objects, even these warning times would be minimal, if not still too short. These telescope designs are just two key examples of proposals to expand the observational capability in order to meet the demands posed by both NEOs and comets. Much more detailed analyses have been made for these and other systems, and more analyses can be done, but we must begin to move to the construction phase of such systems immediately. larger viewing angle to see near-Earth objects. Mankind is battling an array of natural disasters which continually pose a threat to life on this planet. Thanks to advancements in satellites and weather monitoring systems, our ability to forecast major storms and other extreme weather events is improving. Progress is being made in developing earthquake forecasting systems, designed to detect precursors signals which can provide early warnings before seismic events. ((See, IGMASS: Towards International Collaboration in the Defense of Mankind, “Progress in Seismic Forecasting,” 21st Century Science and Technology Magazine, Fall/Winter 2012. See also, Science Can Predict Earthquakes, in the Winter 2011 issue. )) Even our Sun is being watched and analyzed more closely than ever, in attempt to forecast “space weather” events and their effects here on the Earth. However there is another class of events that can not only be foreseen, but can the stopped from ever occurring. Asteroid and comet impacts represent a unique challenge, as we can take the necessary actions to see them coming, but also to ensure the Earth is never again struck in a catastrophic event. While it is likely that we will be able to control storms and certain extreme weather events in the not-too-distant future (if appropriate scientific/economic programs are pursued), for now asteroid defense can hold the title of the only currently preventable natural disaster. But what are the factors determining our ability to defend the planet, and how can these limits be expanded? In defending the Earth from impacts, there are many possible scenarios we could face: a relatively small near-Earth asteroid on a short-term collision course, giving us little time to act; a large asteroid threatening a possible impact in a few decades, proving more time to act, but proving a larger foe; a worst case scenario of a large long-period comet only months away; and any number of possible variations in between. The first line of defense is clear: early detection. No matter how large the threat is, the more warning time we have, the better off we will be. While asteroid and comet detection systems have been discussed in other locations, ((see, Strategic Defense of the Earth, “Part 2: Observation Systems,”)) the subject here is our ability to act on this knowledge. This takes us beyond just asteroid or comets per se, to a general consideration of our power for action within the universe. To state the question in simple terms: 100 years ago we would have had no chance to defend the Earth from an asteroid or comet impact, while presently we have a limited ability to defend the Earth under certain circumstances, and in the future we could foreseeably develop the means to defend against threats currently outside of our defense capability – what determines these qualitative changes? While there are countless important discoveries and technological innovations which have contributed to this process (and shouldn’t have their importance dismissed), the subsuming role of energy-flux density will be considered here. ((“Energy-flux density” as specifically defined by Lyndon LaRouche, in his science of physical economics. For example, see, So, You Wish to Learn All About Economics? : A Text on Elementary Mathematical Economics, New York: New Benjamin Franklin Pub. House, 1984.)) This can be illustrated in first approximation by comparing the energy densities of successive power sources. The significance is not simply found in the increase in energy, but in the physical economic implications: fundamental changes in the human species’ space-time relationship with the universe, where leaps from one level to the next define new (previously impossible) modes of action. As in transportation, for example, development of systems associated with successive fuel sources create fundamentally new possibilities. On the Earth’s surface, the locomotive revolution was associated with coal-fired engines, whereas the internal combustion engine required the advancement to petroleum. Airplane flight depends upon the higher energy to weight ratios of petroleum, but rocket travel from the Earth’s surface to Earth orbit (and beyond) has demanded the most efficient chemical combustion reactions possible. Beyond the consideration of the energy density of a fuel source for transportation, higher levels of energy-flux density have systemic effects for the entire economy. Consideration of the the transitions from the hydrocarbon-based economy to the nuclear economy, and the yet-to-be realized, but desperately needed, transition to the fusion economy, are premier examples. ((For example, regarding mankind’s entry into the nuclear age, see, “The Isotope Economy,” J. Tennenbaum, 21st Century Science and Technology magazine, Fall-Winter 2006. Pertaining to fusion-related directed energy research see, “The Economic Impact of Relativistic Beam Technology,” June 15, 1983; EIR Research Inc. )) Although a fuller treatment is beyond the scope of this writing, the specific applications to the defense of Earth will be discussed here. For the asteroid and comet threats specifically, and ultimately the defense of all life on our planet, the ability to wield higher energy densities becomes crucial. We know for certain that there will be significant asteroid or comet impacts in the future. The question, then, becomes, will we take the necessary actions to deflect or destroy prospective threats before they hit? Moving spacecraft around the solar system is not as simple as moving from location A to location B, because we are dealing with orbits within a gravitational field. For example, current missions to Mars can only be launched at specific times (about every 2.17 years). This is not to wait for the planets to be close in terms of distance across Euclidean space, but it is when the orbital relationships of Earth and Mars provide a least-energy orbital pathway between them. Because changing your orbit requires a change in speed, space travel is often discussed in terms of the change in velocity required (or delta-V requirements). In the case of a potentially threatening near-Earth asteroid, for example, when decades of warning time are available, a minimal energy trajectory can be determined to intercept the asteroid, and the launch date can wait until the trajectories of the Earth and the target reach the positions which provide that relatively low energy path. Relative to many of the asteroids or comets in question, even applying an intense burst of energy quickly may not amount to much of an effect. To use the example provided in the 2010 National Research Council report cited above, if we want to change the position of an asteroid by 2.5 Earth radii (enough to ensure if misses the Earth), this could be done by hitting the target with a kinetic impactor, to either speed it up or slow it down by a tiny amount (only 1 centimeter per second), if that speed change is induced 10 years prior to the feared impact. The 10 year period is required for the small speed change to culminate in a large enough displacement of the target’s future position. For certain medium-sized asteroids this is possible with current technologies (assuming we have a few decades of warning time). If, instead of a kinetic impact, a gravity tractor was used instead, it would also have to begin exerting a small gravitational pull on the asteroid in question years to decades before the impact date (depending on the target’s size), but in this case continuously applying its gravitational potential for the entire time, in order to ensure the asteroid misses the Earth. As a function of the size of the asteroid in question and the amount of time available to act, different deflection options can be compared together on one chart, showing their effectiveness for different time and size scenarios. Such comparisons have been done as part of comprehensive reports on planetary defense, such as the following two examples. These comparisons of mitigation options consistently show that nuclear explosive devices are the most powerful currently available, and, hence, the only option in the cases of short warning times or large objects. However, returning to the opening thesis of this presentation, this is an expression of an underlying principle. As will be seen in the following examples, indicating what can be done with new technological developments, we must look to the role of energy-flux density as the determining factor of various mitigation methods. A variety of different mitigation options have been considered, each with particular benefits and short falls relative to specific scenarios. Given our current technological capabilities, only a few of these options are currently available, although studies, such as those cited above, do provide an indication of what can be possible with future technological developments. However, the point here is not to advocate one specific option, but to examine the considerations which cut across various options, and can provide mankind with a broad-based capability to act in the solar system. As discussed above, kinetic impacts can reach the capabilities of thermonuclear explosives, but only when accelerated with nuclear-explosive propulsion. The capabilities of electric propulsion for rendezvous missions to characterize and study asteroids or comets, or to utilize a gravitational tractor method to alter their trajectories, can be greatly improved when nuclear-electric is utilized instead of solar-electric. With nuclear-thermal propulsion for planetary defense, launch mass and intercept times can be reduced, and we can handle larger threats than we could with chemical propulsion systems. Even the fundamental geometry of our access to the solar system can be revolutionized with the capabilities of nuclear fission and fusion propulsion systems. Although a more thorough analysis can be done, these considerations show that nuclear power is an invariant in improving our capabilities, and the concept of energy-flux density must be taken as a determining factor in planetary defense. Our nuclear fission and thermonuclear fusion capabilities in space, as a broad set of technologies, must be pursued to qualitatively transform our time-space access to, and action within, our solar system. The best path to do this is to adopt a science-driver mission to force the challenge of making these breakthroughs. For example, developing fusion propulsion systems capable of transporting human beings to and from Mars at a constant acceleration/deceleration of 1-gravity (1-G) could be that challenge. Achieving this capability for 1-G space travel over the course of a generation or two will provide the technologies to deal with the threats posed to the Earth. This applies to defense, but also situates defense as a subsumed factor of general scientific and economic advance, in space and on Earth.